Note: this is an update to an older post (View older post here). 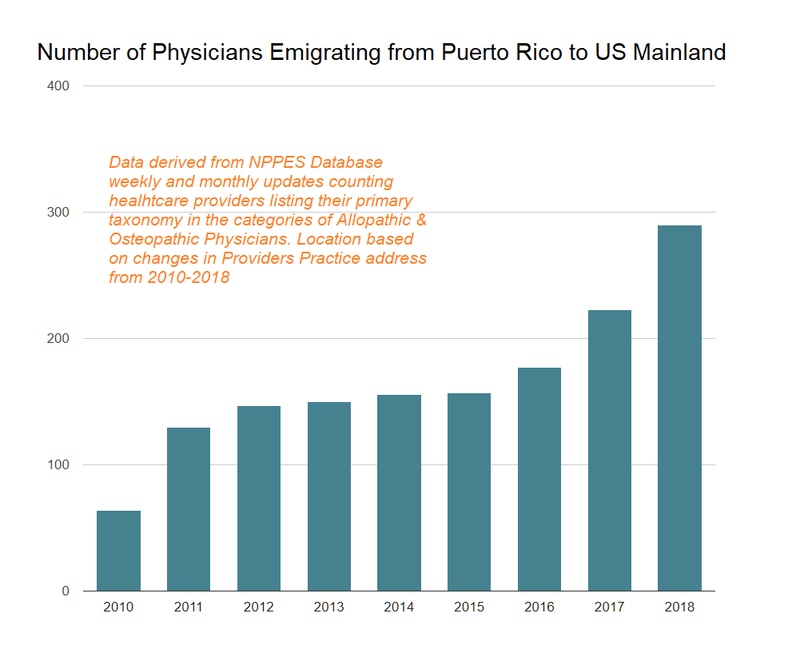 The updated data show a continuation of the dramatic increase of healthcare providers, especially physicians, emigrating from Puerto Rico to the US mainland. The data is up to June 2018 and the numbers seem to be continuing in the same direction. From 2010 to 2018, there has been a systematic rise in the number of health care professionals leaving Puerto Rico. Spanning the eight-year period between 2005 and 2013, not less than 1,200 doctors and surgeons left Puerto Rico to live permanently in the United States . That equates to 12 percent of the more than 10,000 doctors and surgeons who worked on the island during that time. The numbers have only been getting worse. The following is a cartogram of the United States that rescales every state in proportion to the total number of healthcare providers migrating to it from Puerto Rico. The states rescale for each selected year. When you hover over the state it will display the number of healthcare providers that have migrated to the selected state in that year. Data derived from the NPPES database  corroborates these studies. In 2015, there was a little positive reduction in the numbers but 2016 brought with it an all-time high number of emigrating healthcare professionals. These studies also showed that most nurses and doctors left for Puerto Rico for Florida. The next most preferred state for migration is Texas with New York following at a close third. This points to the fact that healthcare professionals believe they have a much higher chance of success in these states than if they remain in Puerto Rico. This massive emigration of doctors is still very evident till today, with doctors often leaving for better wages, working conditions and resources. The data has confirmed our analysis that the occurrence of Hurricane Maria as well as the ongoing struggles for recovery have made these figures to go even higher. Based on the information provided by the United States Bureau of Statistics, in 2016, doctors and surgeons practicing in Puerto Rico earned an average hourly wage of $ 41.45, which is less than half the average hourly wage of $ 99.48 for those who work In the USA . This has also caused insurance companies to delay doctors 'paychecks and replace doctors' expert medical decisions which are often costly treatments for the least expensive. Frustrated with the situation, doctors resort to taking the next flight out of the island. The debt crisis in Puerto Rico has tightened Puerto Rico's income for public programs, including health care, making allocated funds insufficient. The appointment of a financial oversight board that is developing a fiscal plan for Puerto Rico by Congress and many austerity measures are steps being put in place. Experts also cite the inequity in how the federal government reimburses doctors and hospitals in Puerto Rico for patients with Medicaid and Medicare. Puerto Rico obtains a significantly lower percentage of federal funds than the rest of the 50 states. Puerto Rico is approaching what has been referred to as the "Medicaid Cliff". The money for the territory's Medicaid program is in the process of being exhausted by March 2018 . Once this happens, Puerto Rico will be solely responsible for the payment of any deficits. These problems cascade as insurance companies continuously struggle to reimburse physicians for services rendered. Hurricane Maria can be seen as the island's worst hurricane disaster on record. Hurricane Maria erased the only tropical forest in the United States forest system so visitors to the former site now see only the concrete skyline of San Juan 19 miles away. It was an unimaginable sight only few months back. Over time, hurricanes have pushed residents of Puerto Rico away. Hurricane Maria is no different. Reports suggest that weeks after this devastating hurricane struck Puerto Rico, the city still had a lot to contend with in terms of stable electricity supply and standardization of activities. Normally, Puerto Rico should be able to recover from the aftermath of Hurricane Maria. However, a pending financial crisis makes resources for rebuilding scarce. The financial crisis in Puerto Rico has triggered the emigration of medical personnel, leaving the remaining doctors with an overload of patients and causing a cascade of problems for patients and hospitals. While the government, some hospitals and non-profit organizations are offering incentives to try to keep or attract doctors to Puerto Rico, the situation gets worse. However, doctors and nurses are struggling to keep up with the harsh economic situation, with many choosing to move from the island to the US mainland in search of higher wages and improved reimbursements from insurers. A study by the US Department of Health on the Puerto Rico health system  published this year reported that, on an average, patients could wait for as long as 13 hours between arrival and admission and a patient could wait up to nine months to see certain specialists. In a scenario where an appointment is scheduled for 10 o'clock in the morning, most of the day is spent waiting endlessly before seeing a doctor at 4 p.m. Puerto Rican doctors say the medical specialists most needed are neurologists, cardiologists, and surgeons. This situation could get worse over time. In the Puerto Rico Medical Center located in San Juan, there is a consortium of public hospitals which houses only a few essential specialists, such as trauma surgeons. As a consequence, patients often travel to the capital to seek medical attention. The shortage of specialists has increased the demand for physicians who have remained - and public hospitals have been overwhelmed with patients. The Puerto Rico Medical Center which is the only trauma centre on the island and also serves Caribbean islands is therefore under a lot of pressure to serve the teeming population. With the devastation caused by Hurricane Maria, the locals have been moving to the mainland of the United States. There is good research to suggest that hurricanes and other natural disasters urge people to move away. Research papers by Parag Mahajan and Dean Yang of the University of Michigan  found that as a result of the hurricanes, immigration from countries with significant diaspora populations in the United States is increasing. They define "large" as at least 0.86 percent of the population of the country of origin. The population of the Puerto Rican diaspora in the United States is more than 100 percent of the population of the territory of origin. Problems faced by the island of Puerto Rico include the time needed to restore essential services, such as electricity, water, sanitation, and fuel distribution. This not only affects the health system that is already in a dire state but members of the society who need regular supply of medicines for better health or medical equipment for their survival, are looking for a way out of Puerto Rico. While patients struggle with an overloaded medical system that cannot reach them on time, the financial crisis also means that doctors sometimes struggle with being paid for services. Some hospitals, meanwhile, have turned to non-profit organizations to find doctors. Nurses and allied health professionals are not left out of this situation. According to the U.S. Census, the wave of Puerto Ricans emigrating over the years consists of 18- to 44-year-olds, and a significant number are skilled workers, especially nurses. Our research data suggests that this trend has continued and has been accelerating dramatically up to 2018, the data which is only up to June 2018, or half-way through the year. In February 2017, the Governor of Puerto Rico, Ricardo Roselló, signed the Law of Incentives for Retention and Return of Medical Professionals. The Puerto Rican doctors' income tax rate is reduced from 33 percent to 4 percent. To qualify, doctors must complete 180 hours of community service annually. Unfortunately, the tax cut may not be sufficient enough to keep doctors on the island or slow their migration as this is just one of many issues. With the current surge in the migration of doctors and nurses, things are going to get worse. It is necessary that the locals and professionals stay and help in the process of reconstruction after the effects of Hurricane Maria. As the health system has already been in decline in recent times, the emigration of these healthcare professionals will possibly cause further harm to the islands' medical network. Congress could allocate money specifically to rebuild efforts in Puerto Rico, which would attract the expertise of construction companies and developers. Lawmakers could also grant Puerto Rico a suspension of its Promise debt payments and a further debt restructuring of the island. A one-year suspension or more of Promesa's debt payments would mean that there is money to invest in infrastructure, schools and to ensure that hospitals are maintained. More measures should be put in place to allow doctors and nurses to remain in Puerto Rico. Many students in Puerto Rico show genuine interest in medical school. However, after medical school, most of them resort to moving to the mainland United States due to working conditions. Of these, there are a low percentage of health professionals who choose to remain in Puerto Rico despite the existing working conditions. Most doctors complain about how long it takes to have payments made to them after a procedure which they consider very unfair. In addition, the amount of the payments is below compared to what is paid in the rest of the United States. Improving these conditions may help to stem the emigration flow of doctors and nurses to the mainland United States, despite the effects of Hurricane Maria.